To enable truly autonomous mobile robot solutions for material handling, payloads need to be on-loaded and off-loaded with as little human intervention as possible. The following devices are field proven to enhance the user experience. Bin Articulator shown in its retracted configuration. Sometimes it is necessary to extended a payload bin outside of the autonomous mobile robot's frame perimeter. The Bin Articulator is a standalone module that only requires 24 or 12 vDC power, 2 digital outputs (open collector or TTL), 1 digital input, 1 analog input. This accessory works perfectly in conjunction with drop trays. Drop trays allow autonomous mobile robots to retreive payloads without human intervention. 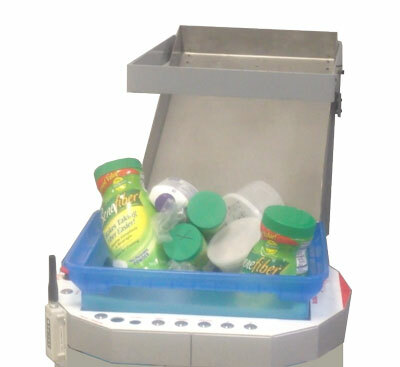 Perfect for material handling applications such as sample pickup or end of product line. Each tray remains locked until a robot commands it to drop once positioned. 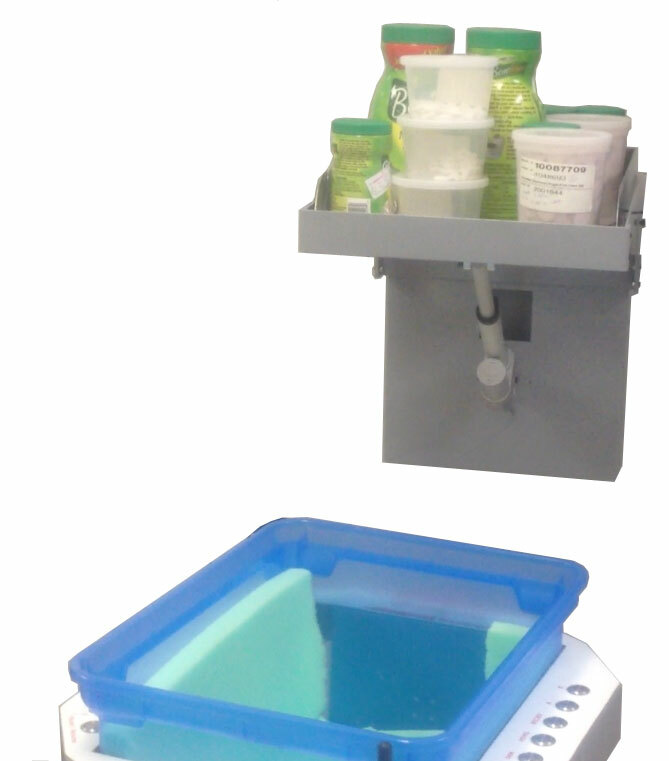 Point to point wireless communication allows a robot to be within 100 feet of the tray. No need for complex WiFi infrastructures. After the robot repositions itself, the tray is commanded to drop allowing the samples to slide into the bin. The combination of the above 2 products allows autonomous mobile robots to gather material without human intervention and secure it during transport. With the addition of wireless call buttons and arrival indicators, a fully functional, 100% autonomous material transport system can be implemented just about anywhere. All CCS Robotics products come standard with proprietary wireless communication modules. There is no need to install WiFi infrastructure nor wrestle with the complexities and politics of existing corporate environments. Every device and robot becomes a repeater in a self configuring mesh-like wireless network. However, if WiFi is preferred, all products can optionally utilize standard 802.11 interfaces.